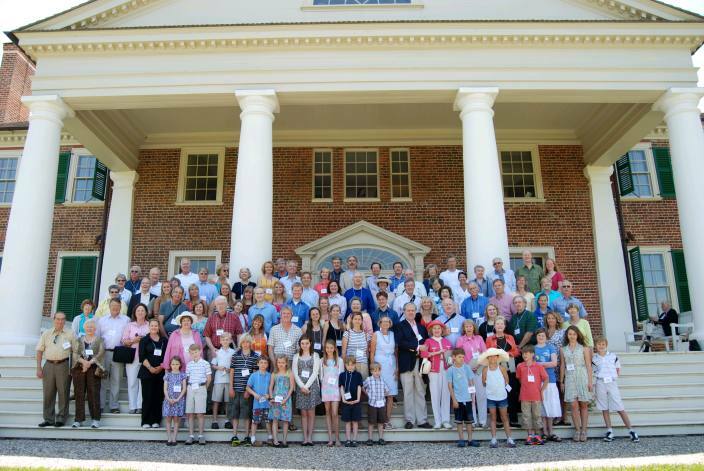 Response to our 2009 Triennial Reunion was amazing, and members who have attended all the reunions to date rank it as "the best by far." A very hard-working Reunion Committee chaired by our Vice President Susan Fogg with the help of her sister Linda Lewis Jester and including Ed Kube, Ann Thornton, Susan Garrett and Iris Eaton ex officio, coordinating through Montpelier's Phyllis Johnson, organized catering, entertainment and educational venues for over 250 of our family connection and special guests for the weekend-long event that drew attendees from both sides of the Atlantic, and from as far away as Hawaii. Wine and weather - and the best of each - were the perfect accompaniment to the ample and elegant dinner and luncheons in the true heart of Virginia's Piedmont that the Madisons loved - and still love - so deeply. The Sunday Memorial Service at our cemetery was, as always, the occasion to remember all who have gone before, as well as to chiefly pay homage to the earliest generations and the inestimable legacy they left us as a family uniquely, as well as the nation and indeed a world of challenging and evolving self-governments. The challenge to the NSMFD to match the success of 2009 is one we take up with energy, devotion and pride, and planning begins now to surpass ourselves once again in 2012. 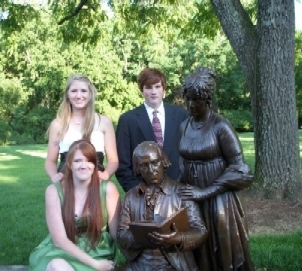 From among the next generation of NSMFD leaders, from left, Caroline Eaton (seated), Anna Liisa Joki and Zachary Eaton, grandchildren of NSMFD Founding President Iris Collins Eaton, with "James and Dolley" at the 2009 Reunion champagne reception on the back lawn at Montpelier.